Films have always played a much loved part in my life. One of my favourites as a child was Dr Doolittle – the man who could “walk with the animals, talk with the animals, grunt and squeak and squawk with the animals” and have them talk back to him. In modern jargon, communicating with animals is all about emotional sensitivity and understanding what animals bring to our lives. There are more than 5,000 species of mammal in the world, yet only about a dozen species have successfully been domesticated. Co-existence and mutual adaption seem to have been the key. Of course, our closest friends are our dogs. They are wonderful companions and, whilst not fluent in English, each certainly knows its name and what the basic commands mean, even if these commands are then ignored. They watch me as I type which is not very exciting, although there is always the chance of a tummy tickle or a quick walk. I might go for a coffee for example and they can speed across the courtyard on a quick adventure. Every evening I turn to Bella, our gorgeous but sadly now rather creaky matriarch Labrador, and say to her “shall we go up now?”. She practically nods, heads to the stairs and climbs a step at a time, pausing frequently, looking back to check I am also there and gathering herself for the next one. At the top she turns for congratulations and a quick cuddle. Dogs are always there, loving you, whatever you look like and whatever you have done or left undone and are thus often more understanding than husbands! They have been part of human history for hundreds of years, hunting with us, protecting us and providing us with faithful companionship. The other animal with whom we have a long history of dependency is, of course, the horse. They may “talk” to us less than dogs but they are intensely social animals. They do whicker or whinny, and in some ways each sound is a “code,” it signifies something. By contrast, most of our human language sounds are arbitrary and have no inherent meaning. Beyond their “code sounds,” communication with horses is about listening and sensing their body language. They do have a relatively large brain for an animal of that size and lots of the brain’s power is allocated to the demanding requirements of maintaining extraordinary agility and controlling their coordination. Horses have been our transport and an escape mechanism, they thrill us with their speed, they have carried soldiers into war and pulled ploughs and carts. Who was not moved to tears by the film “Warhorse”? They can certainly sense what you are feeling, come when called, my horses love scratches and there can be an almost magical cooperation. I ride whenever I can, “up hill and down dale”, pick my way through woods, we squelch along muddy tracks and pick up speed across the parkland. Horses do respond when you try to train them because of course they have to learn and adapt to survive. I hope I learn too: deference and respect for these remarkable animals. Currently, we have two broodmares in foal, one of whom has now delivered. 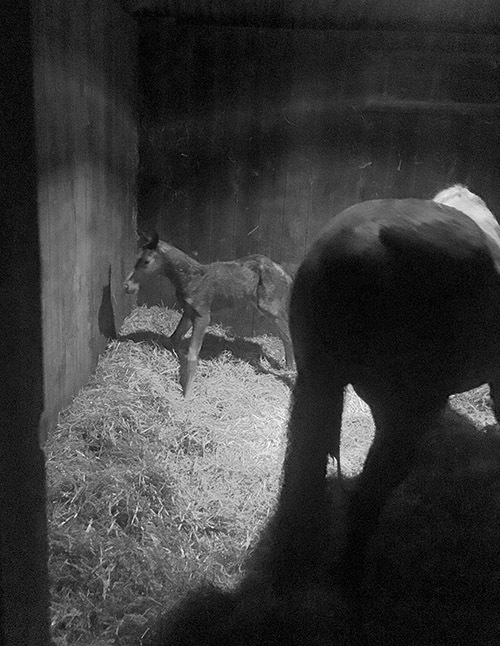 For the last few days we have been able to see the foal moving around and can only imagine the discomfort of those long legs pushing against the mare’s sides. I successfully avoided the ears flat back moments but her grumpiness was understandable. It has been a long process, checking every few hours which was not conducive to sleep quality. It is, however, utterly magical when the feet first appear. I had agreed to head back to the stable at 2am and arrived just as the foal was arriving. I called Maggie our groom, and my husband Geordie. We all spent three hours into the dawn, watching to ensure the success of the first few hours of life. Foals bear the promise of spring, and it is also very nice to have a good night’s sleep again! She is such a pretty foal, thus her nickname is “Bonny”! Welcome to the world Bonny. What a delightful description of your love for animals. I especially enjoyed the horse story and wish Bonny a long and wonderful life. Our granddaughter, Evelyn Susannah, is 12 and loves riding her horse, Betty. She takes lessons every week and is a student assistant at the stables. Thank you for sharing your life at Highclere with us. Looking after horses, cleaning the tack, understanding how it fits together, making sure the ponies are all right first before you that was part of my childhood too!! I think, and this is my OWN opinion, that a dog has more expression in their eyes than people. When an animal is suffering, it is like a child that has not yet learned how to speak or talk, they will let you know by their response, which usually is a reaction of their affection, that they appreciate your warmth and caring. Perhaps we are better at looking and observing a beloved dog ? We have to look because that is the clue. I do utterly agree their eyes tell so much ! Oh so true! The link between dog and man. I adore my dogs. Have had many throughout my life and adore each for their own beautiful personality. Thankyou again for such a thoughtful piece of writing. I so enjoy reading them as they pop up in my email. Are you on the staff of Lady Carnarvon, or just a friendly, regular writer? Thank you for your most generous reply, and positive comments! Definitely not on staff. 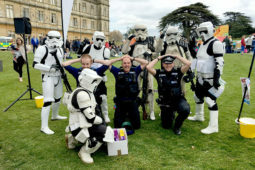 Although I’d love that job! I’m in Australia and just so enjoy reading Lady Canarvon’s emails. They give me my little taste of Britain which I travel to every now and then, & miss very much! She’s gorgeous! Congratulations! I love the big blaze on Bonny’s face. I’m excited to hear when you’re second mare foals and what she has; I hope her labor and delivery are uncomplicated and quick. It takes patience and fortitude to watch over our companion animals as they reach the final hours of their pregnancies. It’s an honor to witness the process, and assist if needed. Speaking of creaky doggo’s, I have one of my own. My Maggie is starting to feel stiff joints and moves up the stairs with a little less enthusiasm these days… along with me! 🙂 The circle of life – if we’re lucky, we see them born, then nurture them through their hopefully long lives, and watch over them in their final days. Our Maggie came to us as a rescue when she was 1 or 2, but we will see out the rest of her days with our family. Have a great week, Lady Carnarvon! It is wonderful to see a post from you arrive in my inbox, and a great way to start my own week. 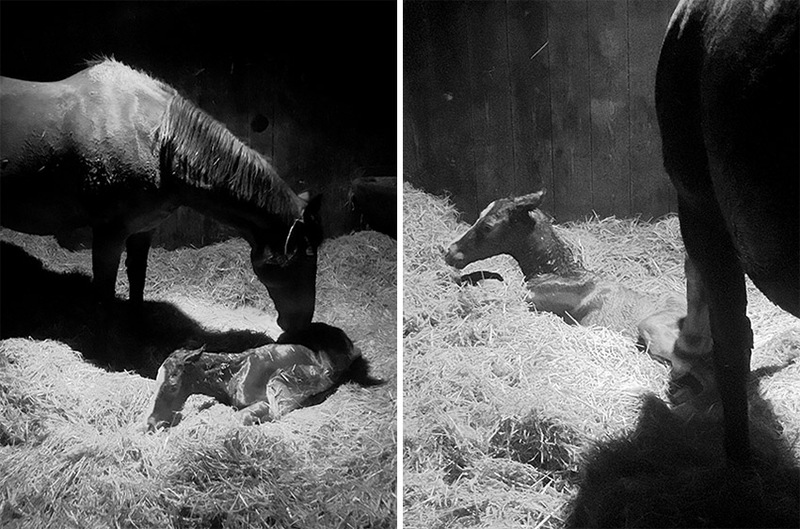 How wonderful to have been able to witness the arrival of the new filly. Wonderfully written. 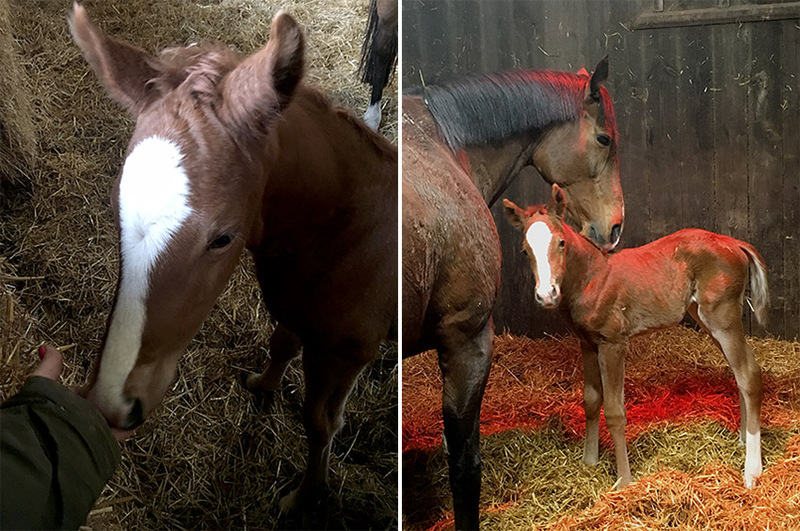 A beautiful way to start the week – horses, a new foal and dogs! No horses in my family, but the dogs are loving, faithful, patient and sneaky when it comes to food on the kitchen counters! All the best to Bonny. How exciting to have a new life in the stable and family! She is gorgeous! Wishing the best to you and your family….all two-legged and four-legged members! Alfie the labrador and Winnie the spaniel are very sneaky, they sort of peel off for their own walks..and are then found inside rooms where the door opens the wrong way for them! The love and delight in animals is one of the truest experiences in this world! Congratulations on your Bonnie girl! Dear Lady Carnarvon, another fantastic blog. Our two best friends in the world, for what is dog spelled backward, but God, and sometimes, our horses take us on paths that make us feel closer to him. Can’t get much better than that. Desiree. A hearty welcome to Bonny; may she enjoy many years of lovely pastures and hacks throughout your delightful estate! I am sure mom and daughter enjoy that heat lamp this time of year. Yes, our dogs are remarkable in that they can read us better than we can at times. They stay nearby when we are not feeling well and can sense when we plan to take a trip to town, even before we grab the keys and shopping list. Horses are such beautiful and noble creature and have served us so well for thousands of years. Those big brown eyes can see deep into our soul, I believe. One elderly ‘gentleman’ where I used to ride, would always put his head down for a scratch, then move his head up and down while I held my hand still. He has since succumbed to old age and I still miss his huge, powerful strides. Thank you for the lovely tribute to four-legged companions! What a beautiful foal Bonny is and such a lovely blaze too! reminds me of my dear old Welsh Cob. To have a strong bond with a horse is truly magical. Enjoy your new arrival. 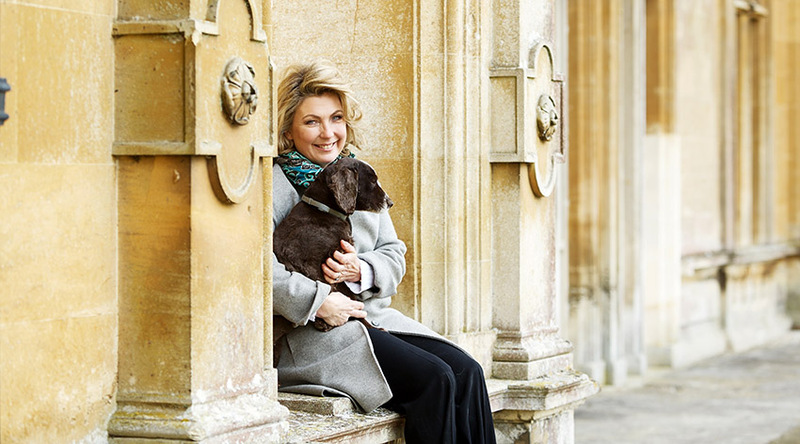 Thank you so much, Lady Carnarvon, for sharing this wonderful blog about your dogs and horses. It is a joy to view your pictures. I especially enjoyed the birth of your new foal, Bonny! Riding horses was a childhood joy for me, and I loved your description of riding yours. And the communications between our animals certainly uplift us, and hopefully the animals too! What a wonderful story of two most gracious animals. There is always something wonderful , yes magical when it comes to having a working ‘farm’ and being able to witness new life makes it especially exciting. Not everyone can enjoy this, but you have eloquently knit the ‘old’ with the ‘new’ and shared with your readers such special moments that we make us all feel closer to our own pets. Thank you so much for sharing your story about Bella. We have a 9 year old Jack Russell Terrier that greets us with a very clear “Hello” when we’ve been away too long, and every evening without fail, MADDIE stands on my husbands chest and stares him down until he says “Would you like to go for a ride”? Creatures of habit, yes I believe so, but we need to give them a bit of credit for being smart. They know they are loved, and the rest will follow. As always, Thank You My Lady for sharing. Nothing wrong with being a creature of habit! OMG!! Your crocuses are up and blooming already!! It’s 20 degrees here in upstate NY. This is an old picture Donald. No sign of crocuses, or even daffodils yet. LOL, my bad, we’re both anxious for spring!! I love getting your blog, thanks for sharing your stories with us. In the past we have had dogs, a cocker spaniel and wire fox terrier. While we loved them and miss them today because we travel a lot we don’t have a dog at the moment. I am sure that sometime in the future there will be another dog in our house just not now. 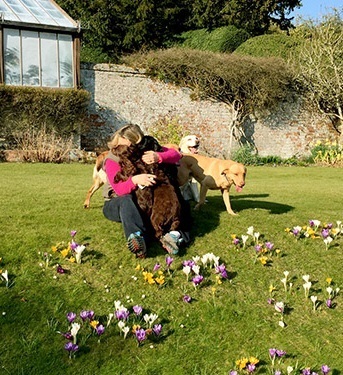 Went today for a walk at a hall in Norfolk….dogs playing, owls flying, snowdrops growing….happiness…love your blog Lady Carnarvon…Bonny is just gorgeous…oh and made your chocolate pots for lunch yesterday…added some raspberries..guests loved them! All the best for Bonny, what a beautiful animal! You’ll let us know when the second one arrives, ’tis a joy to see the photos and tales you blog. You and your husband must have several fine horses at Highclere, there is still a stud farm there, yes? Perhaps “royal” stables too ? And all the doggies are precious, we have to treat them especially well this year, it will be the Lunar Year of the Dog soon, a good sign for peace and understanding! What a delight Bonny will be, so beautiful! Horses and dogs are very great pets, they love us no matter what. Thank you for sharing your animals with us, I can only imagine taking flight (via horseback) through the glorious fields of your magnificent estate. Thank you for allowing us to tag along. Thank you for sharing your beautiful animal stories with us. We love our dogs and horses…it is a pure gift to experience the loving devotion of these extraordinary creatures. And, is there another animal as magnificent as a horse??? Again, I thank you for sharing your precious loved ones with us. Lovely post. We just adopted another rescue dog. Although, we don’t have seven – yet, our fur babies bring happiness and delight every single day. What a lovely blog…and what a pretty colt, and I love the name Bonny! Our 9 year old pup “Suzy” is our best friend. She is a delightful furry faced child! Thank you for the pictures, I can picture your happy place! Thank you for sharing the birth of Bonny! Best wishes for a wonderful life Bonny. I, too, love horses and seeing a new life brings joy to my heart. Welcome to the world, young Bonny! Needless to say, I love the name. As usual – you perk up my day with your lovely blog! What a beautiful filly! Congratulations! It really is worth those sleepless nights to watch a new foal come safely into the world. It was worth it and luckily I got up – just – rather than ignore the alarm clock!!! I have ridden Western but prefer English – I have some good saddles at the moment and that makes such a difference to horse and rider. The bond between humans and dogs and horses is truly special. Growing up, I was a sensitive and shy child who loved dogs, horses and furry creatures of every size and shape. I even had a mini-petting zoo at my suburban California home. Our beloved family dog, Heidi, got along very well with all of my furry friends and always remained loyal. Thank you for sharing! Hopefully, you can catch a good night’s rest now. Welcome to Bonny, a bonny foal! A thoroughly enjoyable post. I too love dogs and horses. Though I’ve never seen puppies or foals born, I imagine that the moment is magical. Bonny is truly bonny and I love your dogs, especially the brown one which must be spaniel of some kind. I am very partial to spaniels, having owned three plus my current Darcie (two males and two females) (and a cocker when I was about 5 years old). The two females were both rescued. I can’t have the luxury of owning more than one at a time, but at least in this way, each is his or her own dog and has his/her own space in my heart. Thanks for the lovely post. We had one spaniel growing up, I am not quite sure how this all happened! Yet another wonderful blog, featuring my two favourite animals, Dogs & Horses, Bonny brings joy to the heart, and the thought of Spring, not being too far away. My two dogs are getting on a bit, my Cocker Spaniel struggles upstairs, but gives a wonderful wag when he gets there, sadly, I thought my beautiful German shepherd last year, I am grateful that I still have two faithful companions. Lovely blog! heartwarming stories of our love and respect for our animals. They are often nicer than humans. Such fun to read your friendly, warm blog. It is a blessing to be able to be there for the miracle of birth! I remember taking my two eldest children to a friend’s farm to see a calf delivered. The reality, which involved a chain with handle and quite a bit of effort on the farmer’s and the mama cow’s part, was not the warm and cozy event I’d imagined for my children! But it’s a wonderful reality! (Puppies are easier! )Thank you for the wonderful word pictures and the photos, too. Though New England is expecting some snow today, spring is on its way for us all! You have had a hard winter – ours has been very wet – it is so muddy..
My wife and I still miss our Labrador/collie cross Teddy.He died four years ago from old age.He was almost 15.He could tell what I was thinking.We’re finding it hard to get another dog as we feel no dog can replace Teddy.A cousin once said to me ‘your dog really loves you’.I really believe that.The feeling was mutual. I really love the relationship you have with your dogs and horses.It is very heart-warming to read. Beautiful Bonny…welcome to the world! Our 2 pups are both rescues from Spain and we speak to them in both Spanish and English…it’s amazing how intelligent dogs are. I loved reading this and such a gorgeous English story reading from the heat of Australia. What a beautiful foal Bonny, We also love our Kelpie , Bessy, dogs are definitely a great friend and comfort to us all. Bessy belongs to our 11 year old son and she is 5 years old. When he goes to bed she hops us and lies with him with her head on the pillow next to his until he is asleep and then she gently gets down and goes out to her bed outside through the doggy door. It is too warm for her to sleep inside and she keeps watch outside at night for us. I am sure she thinks she is human! We visited your lovely home in August last year and I have only just signed up to your blog and I will thoroughly enjoy reading your family news. It was a joy to visit. Thanks for sharing with us. Enjoyed reading the latest blog I also have a creaking Labrador Her early life of being used on a puppy farm in North Wales is now catching up with her. She enjoys her tummy rubs though despite her aches and pains. I also believe,true to her breed,she understands every word connected with food I utter as well as being able to hear a banana being peeled even whilst asleep! Bonny is indeed a beautiful foal. Just this weekend we learned of the passing of a beautiful, majestic white horse, who brought us wonderful moments of thrill, excitement and just enjoyment of looking at her whether just standing around and being petted by adults and children a like or galloping along the sidelines to cheers and music. I am happy that across the pond a healthy foal came into this world and is certain to warm hearts for years to come. Thanks for sharing your experiences and life at Highclere Castle. We rather hope this foal will run fast as well, I just want to focus on giving her a happy confident start in life. Thank you once more for your delightful blog and your connection with our furry companions. Congratulations on the birth of Bonny I had an Alaskan Malamute named Mika, who had a large personality and a penchant for getting into trouble. However, she had these big fluffy white eyebrows that she knew how to work to her advantage. One time I had made a cake that was to be dessert for the friends my parents had gone to dinner with that evening. I knew better than to leave it on the kitchen counter as Mika could easily chomp on it there. I decided it would be safest if I put it in the middle of the dining room table while I cleaned up the kitchen. Do you ever have one of those moments where you know that it is too quiet and somebody is up to no good? Low and behold, there was Mika standing with her front paws on the head of the table, which had tipped down enough so the cake went sliding right to her! She was happily chomping away on my beautifully decorated lemon cake! Oh how I miss her! I hope you like my story as much as I enjoy reading yours! Blessings to you and your team. Thank you. We have a Labrador called Alfie who has very similar habits to your Mika. I am thoroughly enjoying your blog. I am the President of a non-profit horse rescue in Palm City, Florida. Our Equine Rescue and Adoption Foundation currently has 40 horses and a mule. Our doors are constantly revolving as our mission is to rescue, rehab, retrain and adopt out! We are expecting our second foal on our property! Very exiting but I agree, but you are correct, very little sleep happens! Congratulations on your Bonny! 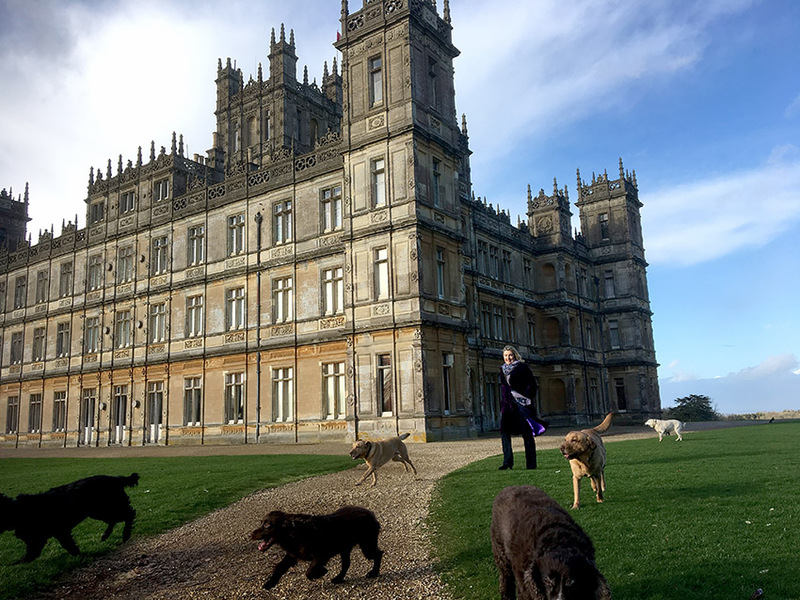 I hope to visit Highclere this fall! What a sweet looking baby girl!! I’d say she was well worth the wait. GOOD DAYS FROM BONNY, LONG LIFE FROM HIM. 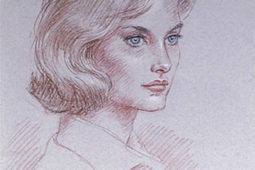 THANK YOU MY LADY ,YOUR BLOG IS LOVELY. It is nice to read about how your life, and the life of your husband, are so entwined in the lives of your animals. By the way, did any of your Labradors “star” in Downton Abbey? No they didn’t. In fact I spent a lot of my time making sure they didn’t get an accidental walk-on part! Although Bella does resemble Lord Grantham’s beloved Labrador Isis. Welcome Bonny! Congratulations to all! I never get tired of reading about dogs and horses and seing beautiful pictures. Please give a huge hug to Bella for me tonight. She is phenomenal to go up these stairs still. What a joy to see the birth of this little horse, he is so cute! Your sweet Bonny looks like she was born a “star” as she has a starburst on her head. What a gorgeous gal to join a family of your beautiful and loving animals. Oh you are blessed! Ohhhh, now this tugged at my heart strings, dear ones! Very nice blog and what a Pretty little Bonny horse! I don’t have any pets myself, but that mention of SPRING really made me smile. Thank you – I know Spring – very welcome thought – the mud is so bad is some parts I lose my wellies!! Hello little Bonny. Welcome to the world. So lovely to read about your beautiful dogs and horses. Our animals enrich our lives so much. Congratulations!!! Lovely horses, just like Bonny. Dogs are the best company of humans, they protect us and they love us unconditionally. This is how my dog showed it during the 17 years of her life … only three months ago she left us. However I have 5 kittens and one of them is deaf, because it seems incredible, but I understand him with gestures. He knows when I tell him to eat or come here, we go everything. Also when he makes a trick and I scold him hahahaha. Congratulations for that family and those precious animals. A greeting. We adore visiting beautiful family homes and taking our girl – Juanita (Winnie) the standard poodle along. 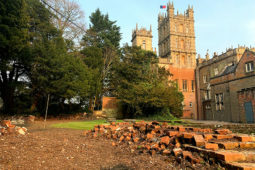 Haven’t made it to Highclere yet but as fans of Downtown Abbey since episode one it is high on our list and we hope to make it soon. I trust Winnie would be welcome too! Thank you she is so pretty! I am able to comment on this blog, and all the earlier posts, too, but for some reason I cannot comment on the new blog: “Mrs Coade”. Can you please check, Lady Carnarvon, why this has happened? I found it very inspiring to read your story of Mrs. Coade and her very dynamic work at a time when women were not able to be in business. Thank you, the good spirits of high tech have returned! I am computer-deficient and travel the world wide web carefully and with high respect for our digital technicians who come to our aid! A beautiful foal. I am always so touched by the love between mother and baby..Animals are so much better at the relationship than humans. My now very elderly cat who strayed into our home has children and grandchildren. The family ties are very strong, but they don’t interact with the other cats at all. When I was child I lived near an estate where the owner kept fine horses. He refused to sell a horse and they were born, lived and died in their home. He bred racehorses and could have sold some for vast prices, but he didn’t. I always thought he was very splendid, even though I suspect he was not quite as fond of people as he was of horses! The quiet and steady love from horses and other animals, is truly one of God’s greatest gifts to us. When you think of it, a horse can feel the leg of one fly on their body. How sensitive? When I go out in the morning to feed my horses and chickens, I often don’t say one word. Sometimes I just stand still in the middle of the paddock and wait. My horse will come up to me and very softly put her muzzle on me. When she takes a spring time nap in the sun and lays down on the grass, she will let me quietly come and lay down with her. The trust is so pure and her love is so strong. My horse is an American Miniature, she stands 36 inches at her withers, and her name is Bonnie! She (and my Cavalier King Charles dog “Bentley” are my very best friends. There is nothing like a dog… period. Always love seeing your beloved pets–would you share what type of spaniel the pretty chocolate brown dog is? Evie is a working Cocker Spaniel and is heaven. It was so much fun to meet you. And the dogs .